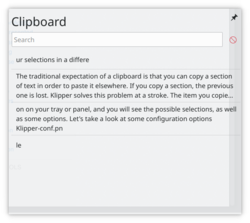 The traditional expectation of a clipboard is that you can copy a section of text in order to paste it elsewhere. If you copy a section, the previous one is lost. Klipper solves this problem at a stroke. The item you copied last will still be the default one to be pasted, but others will have been stored in a buffer, so you can choose to paste your selections in a different order. Even the number of items stored in the buffer can be configured! Click on the icon on your tray or panel, and you will see the possible selections, as well as some options. 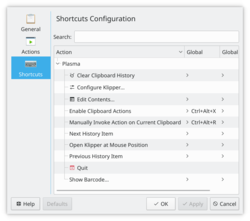 Let's take a look at some configuration options. 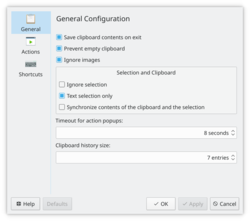 Possibly the two items most important to you on the General tab is whether you want the clipboard to start up empty or to retain its contents across sessions, and whether to synchronise the clipboard contents and selection. The meaning of that one is not immediately obvious, but a clear explanation is in the handbook. You definitely do need to understand this, as choosing the wrong one will be frustrating. If you write scripts or work in programming this section is for you. 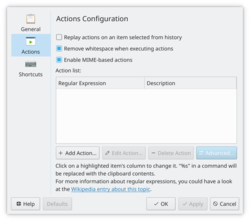 Actions based on regular expressions can be set here. The Handbook is available from the Help menu item. This page was last modified on 6 December 2011, at 20:14. Content is available under Creative Commons License SA 4.0 unless otherwise noted.